Buses depart from Stansted airport and central London roughly every 15 minutes. This transfer service is available on a daily basis all year round. We are comparing Stansted Airport to Central London Bus Transfer Prices from leading ticket suppliers and Try to find you Cheap tickets prices on the market. The Stansted Airport to Central London Bus Transfer is a handy service for all travellers using this airport of London. It provides fast, comfortable and reliable transportation between the airport and the capital of the United Kingdom. Buses depart on a regular basis, both day and night at the intervals of approximately 15 minutes. With a single voucher, you can use the bus transfer service either from Stansted airport to downtown London or in the opposite direction. While travelling between the destinations, you will benefit from comfortable seats, Wi-Fi, air-conditioning and some other convenient amenities. The bus route takes you to some of the famous points of interest in the city of London, including the Marble Arch, Stratford and Baker Street. This very useful service features departures in short intervals both during the day and the night. You can boars a transfer bus at any time so you don't have to worry about the consequences of a delayed flight. Every bus has comfortable seats, enough room for legs, seat-back tables and toilets. The Stansted Airport to Central London Bus Transfer is a convenient option for all travellers in need of an efficient, reliable and comfortable shuttle between the airport and downtown London. It is a budget-friendly option and buses take passengers between the destinations quickly. Your Experience With Stansted Airport to Central London Bus Transfer? With the extremely useful and affordable Stansted Airport to Central London Bus Transfer service, you will reach the centre of London from Stansted Airport in a comfortable and efficient manner. Once your plane lands on Stansted Airport, you need to exchange your voucher for the bus ticket. There no need to worry about time, you can take the next available shuttle to downtown London. Benefit of frequent departures regardless of the time of the day you land on the airport. With this convenient service, you will save time and a lot of money for organizing the transfer on your own. Make use of the hassle-free one-way transfer with a single voucher, either from Stansted Airport to London or vice versa. While travelling, you will have an opportunity to see some attractions of London. The route of the bus covers several transportation hubs along the way to London Victoria coach station. What Stansted Airport to Central London Bus Transfer Includes? One-way transfer between London City Centre and Stansted Airport (in either direction). Complimentary amenities include power sockets, onboard wireless internet and air conditioning. 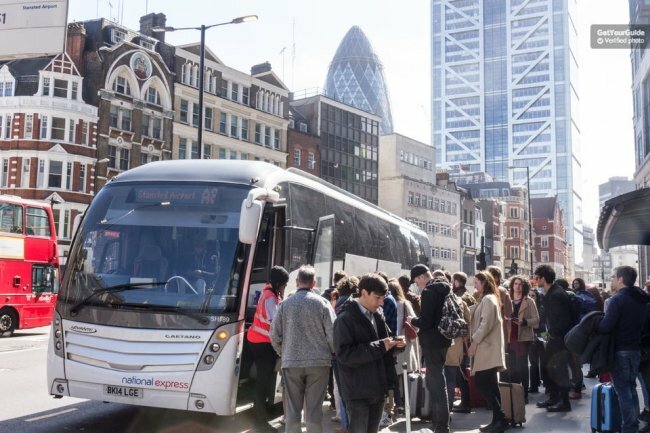 Bus transfers are usually the quickest and most cost effective means of transport between the airport and the city of London. Travelers Reviews about Stansted Airport to Central London Bus Transfer? On Get Your Guide, this useful service has a great 4.5 out of 5 rating. Users of TripAdvisor assessed the overall experience with the average rate of 4 out of 5. Most users of the transfer service say that the staff are very pleasant. Reliability and efficiency are also great assets of the National Express. Stansted Airport transfer service is provided by the National Express, their coaches are wheelchair accessible. You need to present the printed voucher for the exchange for the bus ticket. In case that circumstances change, you can receive the full refund for cancellations up to 24 hours in advance. Every bus of the National Express has leather seats, sufficient room for legs and toilets. Most buses also have power sockets and complimentary Wi-Fi. Once you land on Stansted airport, you can exchange your voucher for the bus ticket at any of airport's many retail desks. At the same time, you can specify the date of the return journey. You can use the voucher for the return journey within 3 months.